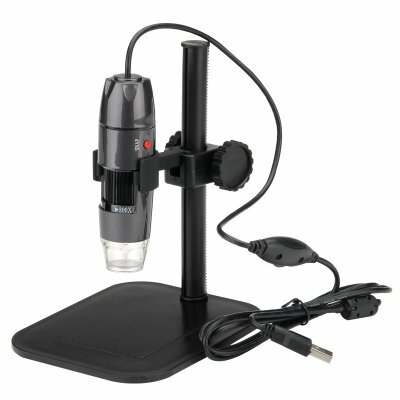 Successfully Added Digital USB Microscope - 800 Zoom, Video + Photos, 8 LEDs, 1280x1024 Resolutions to your Shopping Cart. With a 20 time to 800 times adjustable zoom this digital microscope is a fantastic tool for anyone wanting to get a close up on the world. Whether you’re working on electrical circuits, teaching in the classroom or working in a laboratory this digital USB microspore lets you snap 1280x1024 images and record decent quality video. It has a focal range from 0 to 40 mm and let you zoom in up to 800 times for a close up of the microscopic so you can get enough room to work on all your projects and its perfect for SMD component work. The USB Digital microscope has 8 built in white LEDs which can easily be adjusted to bring the best level of lighting for the task at hand. This USB microscope can be used with most Windows PCs and comes with an adjustable stand so as you can mount it over any item you wish to study. Being light weight and compact make it ideal for field work where it can be setup in just a couple of minutes and serve as part of a mobile laboratory or for hands on education or studying antiquities of the world. This is the perfect addition to any classroom and makes for a superb educational tool helping to ignite the imagination of young scientist and explorers as they venture forth in to a world of discovery. This Digital USB Microscope comes with a 12 months warranty. Brought to you by the leader in electronic devices as well as wholesale digital microscopes and measuring tools..